^ a. Kuala Lumpur is the capital city and is home to the legislative branch of the Federal government. Putrajaya is the primary seat of the federal government where the executive and judicial branches are located. ^ b. The current terminology as per government policy is Bahasa Malaysia (literally Malaysian language) but legislation continues to refer to the official language as Bahasa Melayu (literally Malay language). ^ c. English may continue to be used for some official purposes under the National Language Act 1967. ^ d. Singapore became an independent country on 9 August 1965. 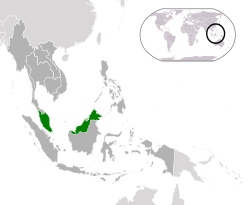 ↑ "Malaysian Flag and Coat of Arms". Malaysian government. Retrieved 26 October 2010. ↑ "Laporan Kiraan Permulaan 2010". Jabatan Perangkaan Malaysia. p. iii. Retrieved 31 January 2011. ↑ 8.0 8.1 8.2 8.3 "Malaysia". International Monetary Fund. Retrieved 30 April 2011. ↑ Wong Chun Wai And Audrey Edwards (4 June 2007). "Back to Bahasa Malaysia". Thestar.com.my. Retrieved 26 October 2010. Àtunṣe ojúewé yi gbẹ̀yìn wáyé ni ọjọ́ 11 Oṣù Kàrún 2018, ni ago 00:26.